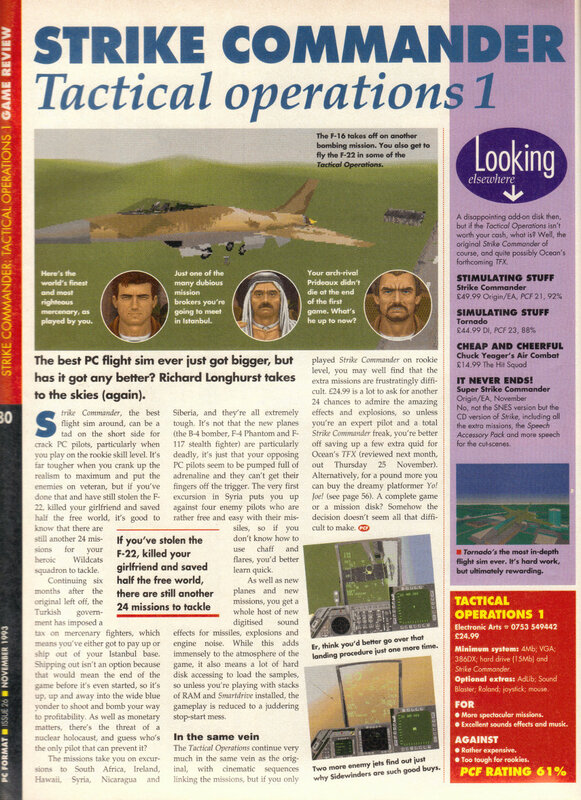 This was taken from the November 1993 PC Format. The missions in Costa Rica carry on in the same vein. The ground support of the Rhinos isn’t in evidence for the first couple of missions although the planes they are flying go down very easily. The third mission is a bit more interesting. The Rhinos have called in ground support and we have to take it out. On the way we fly through their airstrip and I get to gun down the launching planes. Its then onto the column of ground vehicles which we have to take out – there are plenty of them but they are undefended so are sitting ducks. Killing these off completes this mission. At this point I was seriously low on cash but I guess the sale of the F22 must have gone through as I’ve now got 40 million in the bank. Its back to Selims – there is a new fixer there this time but I take the remaining mission from the first batch instead for now. This time its off to New Siberia to destroy a bomber base. It follows the usual structure taking out air support in the first two missions and then bombing the base in the third. There is a final bonus mission to take out 3 Hercules planes which I have to fly solo as everyone else has already packed up. Its back to Selims with just the one option left. This new fixer called Maxwell offers a mission paying 12 million in India protecting their newly discovered gold from the Nicaraguans. After a couple of dogfight missions, I get to take out a building in a city in an attempt to kill the Nicoraguan leader. In the end he escapes and I have to shoot his yacht down in mission 4. The games still going and that was mission 22 so the box understated the number for some reason. There is still only the one fixer left at Selims though and this time its off to British Columbia to help it gain independence from Canada. On the flight over there we stop off in Ireland and we learn that a load of Tomahawk missiles has been stolen and launched. We have to take down the missiles before they strike. At least this is something new, although I’ll be seeing a few similar missions in Wing Commander games to come. After the mission the final cutscene kicks in. It’s an inconclusive end where the Wildcats just land after completing the mission. Nothing in particular happened in the storyline overall and I was expecting us to find a new base outside of Turkey or something. Even if you really loved Strike Commander, you would have been a bit disappointed with this add on. It wasn’t too bad to play through but I really hope that Pacific Strike & Wings of Glory will have a bit more to offer and have something to add to the formula. This is the final game Origin released in 1993 that I’ve still to play and was the one and only add-on pack released for Strike Commander. I’m going into this knowing what I’m going to get – more of the same. There are no new weapons, no new planes and as far as I know no new overall storyline although there must be story for each campaign. This makes this add-on basically a set of standalone campaigns like all the optional ones from the original game. The last thing Strike Commander needed was more of the same as there was too much of that in the original game for my liking. With the epic scale of Serpent Isle it seems like a while since I played Strike Commander though so I’m actually keener than I expected to start this and there are only 21 new missions so it shouldn’t take that long to complete. I can’t imagine that a load of similar missions with no plot is going to give me a lot to write about so these could be some short posts. The game starts sixth months after the last one. The wildcats have been on holiday and are just returning back to duty. Virgil informs me that Turkey are putting taxes through the roof and we need to find some work. The first two missions involve taking out Turkish training bases where pilots are being prepared to enforce the new taxes. I get to fly the F22 again in the first of these missions – the starting difficulty is a lot harder as you would expect from a mission pack but otherwise they are just the sort of thing I saw in the first game. We wipe out the training bases, but we still need money as these missions were unpaid and we probably need to relocate before the taxes are enforcable. I go to Selims to find a job and Prideaux is still hanging around and in business. I only have the one job to choose from which is helping the South Africans in some border conflicts. Again for the first of these missions I get to fly the F22. The jackals appear to be supporting the opposition so we decide to take their base out in mission 2. I can tell somethings going on here when I don’t get to choose my wingman. Instead Lyle joins me at at nav 1 only to get killed by the Jackals later in the mission. The mission is aborted at this point but we get revenge in the next one by blowing up the Jackals base. Thats as far as I got for now. After thinking the change from Serpent Isle would be fun, I’m pretty unenthusiastic now I’ve started. It looks like there may be a reasonable plot to the game after all but the missions are just the same thing all over again and I’m pretty bored with them already. In short, if I wasn’t doing this blog, there is no way I’d bother playing this game. I guess you could level the same complaint at the Wing Commander games but I simply find Wing Commander more fun to play than this + there is a little more variety in my opinion. I’ll stick with it but I’m not going to enjoy this one especially – it will probably be a case of picking off a few missions at a time until its done. Its only taken an hour or so to do 1/4 of the game so unless the difficulty level goes through the roof I should still finish this one up by the end of the week.